Secret Show – Cascao & Lady Maru + She Said What?! Arrivano da Roma e fanno ballare i muri. Una bella mail e passa la paura. Quando è lì in cima. Cascao e lady Maru è un duo electro, proveniente dalla scena punk-no wave di roma caput kaput. Cascao è un produttore – ballerino dell’underground romano, Lady Maru è una dj e producer di techno, deep e house con passione per musiche strambe da bar di quartiere . Entrambi hanno anche altri progetti live attivi, lui Nastro e lei Trouble vs Glue. I due cominciano a lavorare insieme nel 2008 , producono due album e diversi singoli anche con remix , il loro live è vivace, basi elettroniche cantate, con batterie a pad , campionatore, 2 sinth e chitarra suonati live . 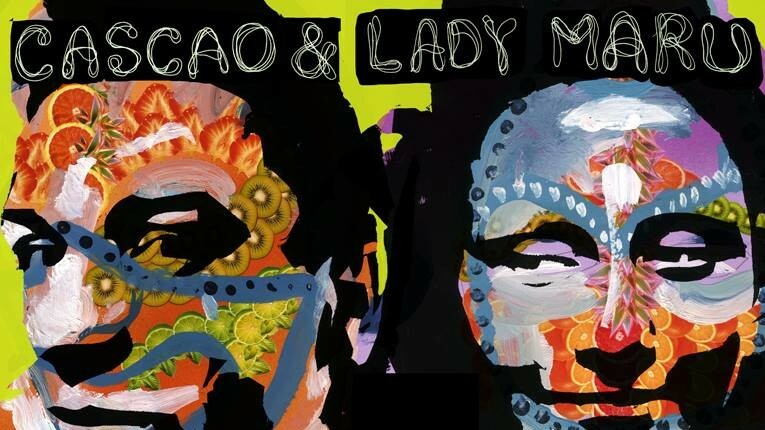 Cascao & Lady Maru are a quirky-electro-duo, coming from the saucy-punk-no-wave scene of the aethernal Rome. Cascao is a freaky dancer and producer,Lady Maru is a techno house dj and no wave-punk musician in the bizarre roman underground: they started their work togheter in 2008 and it quickly turned into a wacky-dancey live act, with guitar, synthie, some live samples and percussions… funny tribalism and poppy arty melodies: evoking talking heads, the residents, and the proto 70’ies 80 ies wave stuff. During their first european tour in Berlin they met Khan of “i am single records” .He took them on his label at first with 2 singles “Tropical Tasting ” and “Burundance” with remixes by Khan, Rodion, Vinny Villbass , Ikuo, then with their first full lenghth album “Gong” , postproduced and mixed byRodion(Gomma rec. ), november 2011. One other pop single came out in December 2011 on Glamnight Records, a nice roman electro-house label, running some great busy electro nights. In 2014 they have released 4 tracks on an italian techno and electronic label called I-Electronix , one of these tracks, “Keep it on “, has been featured on various beatport’s nu -disco charts.